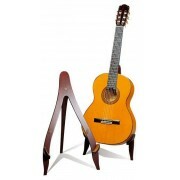 The guitar Prudencio Saez G3 is a classical guitar built in Spain with quality materials. Is an intermediate guitar from Prudencio Saez guitars made with solid woods. Special atention is paid in the action of the guitar with the student in mind. The sound is rich, with plenty of volume and a very well balanced sound. The solid Sapele body gives the guitar a good sound projection and the solid cedar top provides a professional sound. The quality of this guitar is very surprising considering its good price.